Our April issue takes you on an exclusive tour through the Petersen Automotive Museum in the Wilshire District on the west side of Los Angeles, California, the home of the established automotive culture and the current lowrider exhibit, “La Vida Lowrider: Cruising the City of Angels.” Honored and showcased in this exhibit are more than 20 vehicles, leveled out on the showroom floor and exposed for all to see. Car club memorabilia hangs on the walls like framed art, along with lowrider bikes and model cars, all highly decorated with passion at this monumental event. Please visit this prestigious lowrider exhibit either through the pages of the magazine or by personally appearing at this eight-month long event. You will feel the evolution that is lowriding and the impact of inspiration. 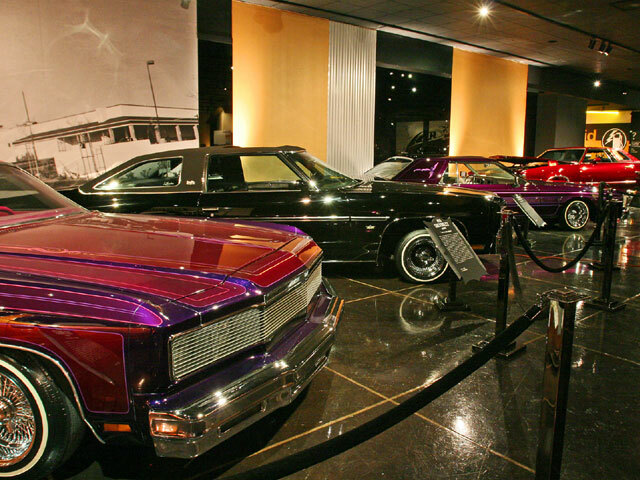 Though the lowriders and car clubs featured at this historical event have a deep-rooted history in the Los Angeles area, they still represent lowriders from everywhere! “Riviera Paradise” is our classic cover car. Owned by professional photographer Marco Patio, this wild ’65 Buick Riviera is named after a song by famed rock ‘n’ roll guitarist Stevie Ray Vaughn. Those voluptuous Rivi body-line rides always look good in lime green! And Bert, from the famous Chevy Shop, pops out one of his beautiful treasures, a silver and black ’56 Chevy rag. We also took a drive down the coast to cover the annual San Diego Super Indoor Custom Car Show, which continues to grow stronger each year. Our Raza Report returns with a feature on musician Ry Cooder’s customized classic lowrider-styled ice cream truck, which was brush painted in oil by well-known artist Vincent Valdez. The true to life images on the bomb truck represent the life and times of the neighborhood known as Chavez Ravine, as well as eminent domain and its tragedies to make way for Dodger Stadium. Lowriding has lost another one of its leaders, a man who inspired others with the examples he set. Billy Felix of Las Vegas’ Desireable Ones C.C. helped spread the lowriding culture in “Sin City” and we pay tribute to him in Raza Report. RIP (Ride In Peace), Billy.